“Grace abounds through music,” said Manuel Lopez, one of the leaders of Coro Filarmónico Movimiento Misionero, an organization in Guatemala City that rescues kids and young adults from street gangs and violent homes by teaching them to be musicians. I’ve been playing trombone continuously since I was in beginner band in 1968, longer than I’ve done anything except ride a bicycle or read books. Not only that, music runs deep between Cyndi and me. We met for the first time in a high school band hall in 1973; we started falling in love with each other at a University of North Texas One O’clock Lab Band concert featuring Bill Watrous in 1976. I’ve played in jazz bands since high school, and those have always been the most fun. I’ve never been a lead player although I’ve occasionally stumbled into it by default, and I’ve never been a soloist even though my heart has always wished I were. I told people I was a utility player, meaning I played my parts but I wasn’t a soloist. That was a cowardly dodge, though. It might’ve sounded smart to me at the time, but I was hiding. So last December while playing with the Midland College Jazz Band I stood up and played an improvised solo in front of an audience for the first time. It was not great, but I did it. I was a beginner in public, something I’ve spent my entire adult life trying to avoid. Typically I’d rather stay seated, even if it meant missing an opportunity, than stand up as a novice in front of family and friends. Who knows how many cool things I’ve missed because of that? The Enemy certainly used that fear to stomp down my expectations and dreams. But then, for some reason, last fall, I decided my Fear Of Looking Foolish (FOLF) was less than my Fear Of Missing Out (FOMO). I didn’t want to live out my life having never tried. I told Cyndi it feels like I’ve been on a journey of reengagement with music. I date the beginning around a Wynton Marsalis concert (Oct 2015), when I started leaning into it a bit more. I stepped further in after we attended Camp Kirkland’s Instrumental Convergence in Tyler, Texas, in Mar 2016. It was fun and exciting to be around so many adult musicians, especially trombone players, and I came home inspired to play more and play better. That weekend in Tyler led to Cyndi and me traveling on a music mission trip to Israel with Global Missions Project in Nov 2016. And then I enrolled for trombone lessons, for the first time in forty years. I’d grown lazy and complacent as a musician and needed a professional reboot. 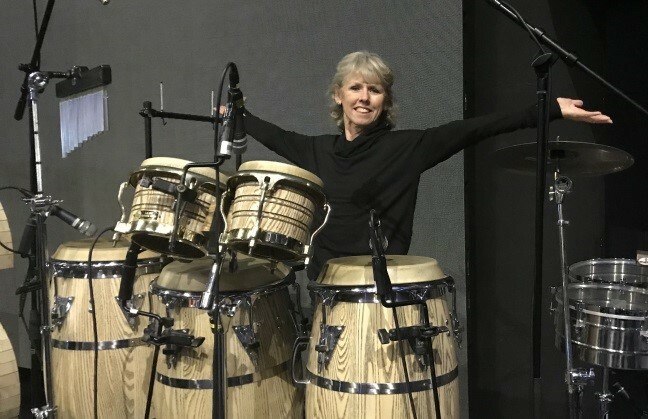 My most recent move further in took place over the New Year’s holidays when Cyndi and I joined another Global Missions Project, the Metro Big Band trip to Guatemala. It was scary at first, for both of us. Not the Central America part, but the jazz band part. All the musicians were amazing and we both felt like inadequate beginners. But we grew into our places with each performance, and by the end felt comfortable playing with the band. Now we can’t wait to take another trip. Here’s the thing about this deepening journey into music: It makes me happy to be 61 years old and reengaging with something I’ve loved since I was twelve. I’m glad to know I still have improvement ahead of me. Here’s another thing: It’s really about learning to give away what I’ve received. God has placed specific gifts within each of us. For some, it’s music. For others, it might be painting, or teaching, organizing, counseling, or giving … the list of gifts is long and wide. It’s usually simple to identify those gifts – they are the things people notice and compliment - they make us come alive when we use them. However, we tend to discount our own gifts because they seem natural to us, and maybe because we don’t think we have the skills to use them well. But God didn’t give us gifts just to brighten our lives; He expects us to give them away. First Corinthians 15:3 says, “For what I received I passed on to you as of first importance” (NIV) We are obligated to give away what God has given to us. During one of our concerts, in the Casa Bernabé Orphanage near Guatemala City, I remembered the long list of people who have invested in my heart for music: my dad, who showed me that grown men were musicians; band directors in Kermit (Mr. Gillian), Hobbs (Bob Lane), University of Oklahoma (Gene Thrailkill), and in Midland (Rabon Bewley); private teachers Worley Hines and Nick Conn. Thinking of all that God poured into me, I was grateful for the opportunity to give it away to those children and future musicians. I owed it to them. I owed it to God. Ask yourself, where do you need to reengage? Where have you, like me, grown lazy and complacent? Are you passing along what you received from God as of first importance?